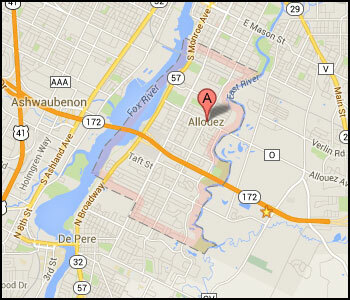 Ever wondered where the name Allouez came from? Or perhaps you are from out of town and have no idea how the locals pronounce it (al – ah – way). Pere Claude Allouez was a French Catholic missionary who arrived in the area in 1671. The first European settlers in the Green Bay area actually claimed the area as French territory. In the year of 1856 the Town of Bellevue was established and by 1874 the Town of Allouez separated from the Town of Bellevue. The first large scale industrial activities were brewing and shipbuilding. Residential settlement of the Allouez area continued to increase. In 1985 the Town of Allouez became the village of Allouez. For a more detailed history of the area please contact the Brown County Historical Society. In 2006 Allouez built a new municipal building on Libal Street. Visit the Village’s website to learn about the Allouez community and services. Allouez has 8 parks, well, really 7, but Green Isle Park is broken up. There are various tennis courts, soccer fields, baseball fields, playgrounds, and plenty of green space to relax and take a much needed breath! Click here to a list and addresses for them. You might have also heard about East River Trail. This particular trail glides along the East River and you can find bikers, runners, walkers, rollerbladers, skateboarders, and more. The East River Trail is groomed for cross country skiing during the winter months. In addition to the East River Trail, there is also the scenic Fox River Trail which passes through Allouez. The length of this trail is 25 miles, which 10 miles of it is paved. Allouez is also the home of Heritage Hill, which is a State Historical Park. Where to eat, drink, and be merry? There are plenty of hotspots! Allouez caters to different cuisines and themed restaurants and bars. I bet a few of your favorites are located here. Click here to see the list. Allouez has a long history from the time that the first European settlers arrived in 1671. Given the long history there are a great variety of architectural styles found in Allouez homes which were popular through different periods. The ranch style home is actually the most pervasive style found in Allouez. In 2012 and 2013 an Architectural and Historical Intensive Survey Report was completed for the Village of Allouez and has a very detailed account of home architectural styles in the area. Click here to view a PDF of part 1 of the report. The past year 221 homes were sold and new people moved in. The average number of days on the market was 93. The average percent of homes listed that sold was 96%. Allouez is centrally located to the City of Green Bay. It is bordered by Green Bay on the north and east, Bellevue to the southeast, De Pere on the southwest and the Fox River on the northwest. Interested in homes in the Allouez area — whether you want to sell or buy, contact Elysia today! What Homes are Available in Allouez? New houses come on the market in Allouez regularly so if can’t find that perfect house today, let Elysia know what you’re looking for and she can monitor the market and alert you when something meeting your criteria is listed. Click Here for a current list of Allouez Homes for Sale.